Some people say they made history with chocolate. We’re satisfied to say we’ve made prehistory. Franco Ruta’s slogan rang loud and clear during the chocolate boom of Modica several years ago. It describes the road taken by the Dolceria Bonajuto, founded in 1880 by Francesco Bonajuto. Their chocolate, produced using a unique method, is a child of history; in 1516, the “chocolate de pedra” technique of processing chocolate in cold temperatures – the so-called “Aztec technique” of grinding the cacao and sugar together – came from Mexico (where the technique is still called “chocolate de pedra,” 500 years later) and arrived in Modica with the Spanish dominion. Over the course of the next two centuries, the Spaniards also gave the city several metate, or curved stones used for grinding the cacao and sugar without heating it enough to melt the sugar. The unique aspect of Modica’s chocolate is its granular consistency, a particular treat for chocolate lovers. The Spaniards left in 1716, but their technique hung on. 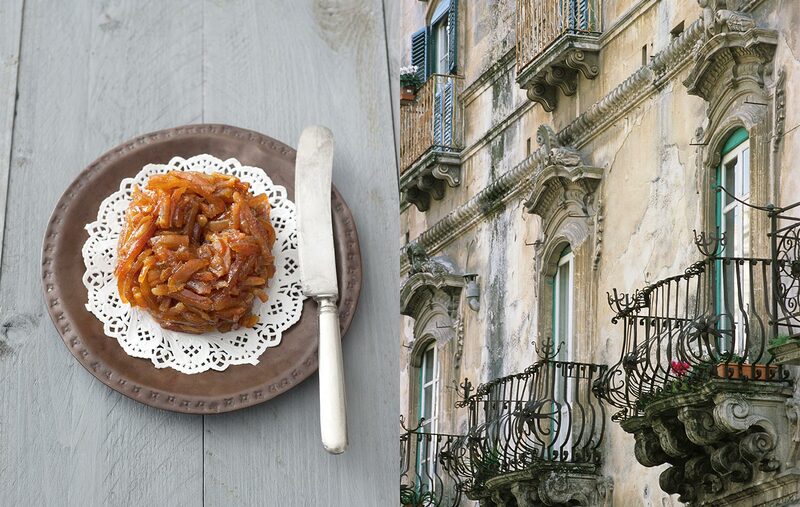 During the 1900s, the people of Modica continued to process chocolate in families and in some chocolate factories, the most ancient and first of which was Bonajuto. In the 1990s, Franco Ruta, the heir of the Bonajuto chocolate legacy through his mother’s side, ventured on making and communicating his family company’s chocolate. In the 2000s, his son Pierpaolo, a passionate visionary like Franco, joined his father in the business. 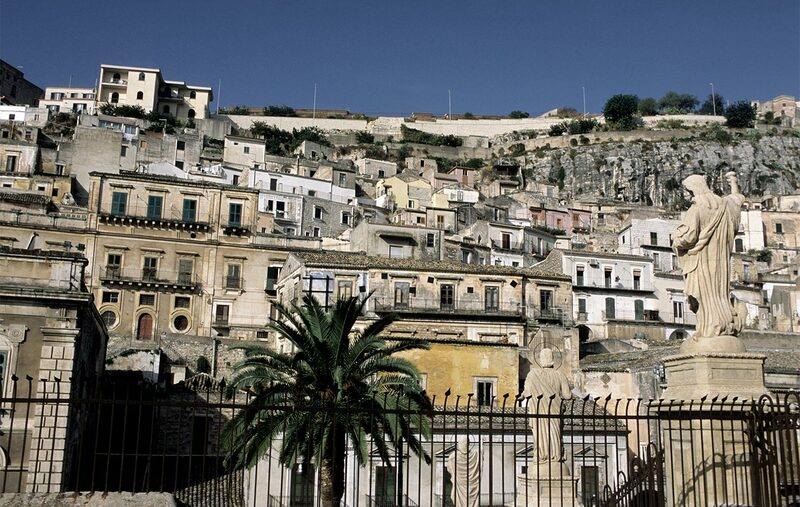 Meanwhile, the Baroque cities of Sicily like Modica were revived, the international fame of the television series Inspector Montalbano made southeastern Sicily an ever more popular tourist destination, and the chocolate factories of Modica blossomed like mushrooms. The road that Franco and Pierpaolo Ruta took sets Bonajuto chocolate apart from imitators, however – they carry out continuous research and innovative revisioning of ingredients, without ever cutting the thread of tradition. And, their capacity to organize an empassioned and competent team supports all these efforts. Their latest chocolates are the perfect examples of this. Their jasmine chocolate, for one, was created following a 17th century recipe. It takes advantage of the high absorbing capacity of the cacao beans, a characteristic that is normally regarded as “risky” when processing, explains Franco Ruta. The jasmine flowers are scattered directly over the cacao beans and then removed. Using these beans that have absorbed the essence of jasmine, he creates a chocolate elixir in the form of tiny but powerful chocolates. A similar process is used for their chocolates made with IGP lemons of Syracuse. The cacao beans are put into contact with the lemon peel and retain their fragrance; incredibly, the four different lemon harvests during the year give the lemon chocolate four subtle, seasonal nuances. Under the same concept of creating new chocolates while retaining old traditions, Bonajuto created the Maris praline, new this year. “We created Maris from our idea of expressing the island of Sicily not just through ingredients that come from its earth, but also from the sea.” Father and son were accused, at first, of overstepping their bounds with visionary excess and of wanting to impress the bourgeoisie. But they forged ahead. “Salt has always been an ingredient in Modica chocolates,” explains Franco, “because it’s an antifermentative. 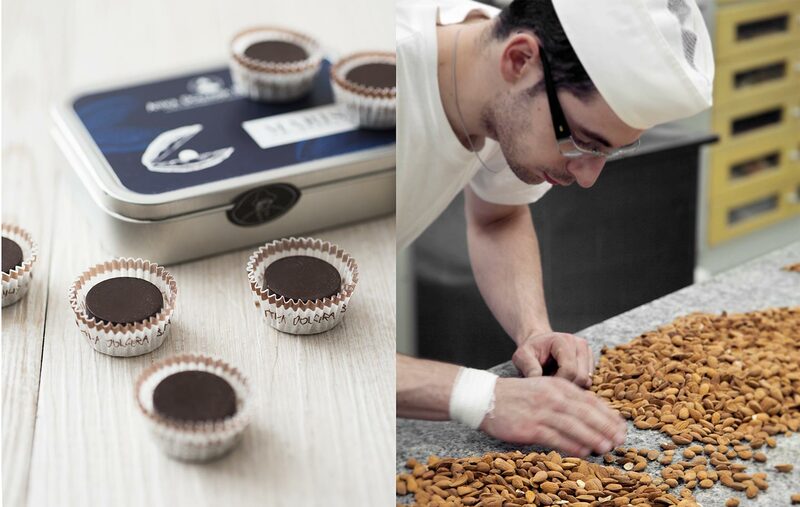 Nori seaweed gives our Maris pralines a crunchiness, and the caviar completes the picture.” Those who taste Maris pralines for the first time may be hesitant, but this praline reveals delightful sensations in the mouth, leaving the palate touched by the sea. All the Ruta boys need now is a beer to call it a day. Actually, they’ve already got one; in collaboration with a small craft brewery of Modica, Tarì, they’ve produced the Bonajuto beer with cacao beans. As Franco invites us to try the beer paired with raw seafood, it’s then that we see little Francsca, daughter of Pierpaolo, taking her very first steps. She’ll need quite a lot of creativity to follow in the footsteps of her father and grandfather!